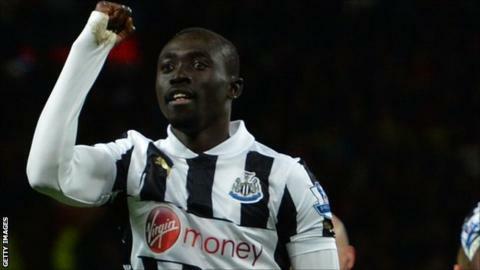 Newcastle boss Alan Pardew has said Tuesday's Capital One Cup exit was softened by the goal which ended Papiss Demba Cisse's scoring drought. The Senegal international's header was his first goal of the season but was not enough to deny Manchester United a 2-1 victory in their third round tie. "It was everything because he needed a goal," Pardew told BBC Newcastle. "Now the media can't put that round his neck anymore, his feathers were up, and the second one I thought was in." Cisse's previous Magpies effort came in a 2-0 Premier League win at Chelsea, an effort later chosen as Match of the Day's Goal of the Season for 2011-12. Meanwhile Pardew was also pleased to oversee a return from injury for Fabricio Coloccini, and another unblemished outing for Ivory Coast midfielder Cheick Tiote. Argentina international Coloccini lasted an hour before making way for Shane Ferguson, while Tiote was replaced by Gael Bigirimana on 71 minutes. "We knew they probably wouldn't last the 90 minutes," Pardew continued. "It was a tough game, they move the ball so fast and you have a lot of work to put in even for 70 minutes. "But they both got through that and it was very good."